The top cat in Africa, African Lion is the undisputed king of the plains of Africa. Having evolved approximately a million years ago on the African continent, the big cat is found today in many different parts of Sub-Saharan Africa. Slightly larger than the Asian lion, the African Lion has captivated human imagination more than any other animal and has for centuries been an emblem of strength, courage and nobility in most cultures of the world. A massively powerful animal, the African Lion weighs in the range of four hundred and fifty to five hundred and fifty pounds for healthy adult males whereas females are usually in the range of three hundred to three hundred and fifty pounds. Length is between six to eight feet for males and five to six feet for females, excluding a near three foot tail. Significantly bigger individuals have been recorded though. 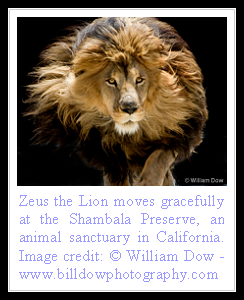 The largest wild lion ever weighed was close to seven hundred pounds. In captivity a specimen of well over eight hundred pound is documented. Height at shoulders is close to four feet for males and three and a half feet for females. The lion's coat is tawny in coloration and plain. Fur is short and somewhat coarse. Males are distinguished by their big mane that covers head, neck and part of belly and back. The mane is pale in coloration initially and goes through shades to golden to black as the lion ages. A black colored full mane signifies a mature lion with good breeding potential and is often preferred by lionesses for a partner. In some parts of Africa, including Senegal and notably Tsavo, Kenya, maneless male lions are recorded, possibly in adaptation for the thorny habitat of that regions. Overall the built is muscular for both sexes. Lionesses are more athletic since it allows them to excel in hunting, their primary role in the pride. Male lions are bulkier since the added weight and strength allows them to fight off intruders and defend the pride's territory. Weapons include sharp claws and near three inch canines. Jaws are powerful and skull is bigger than any other cat species. Eyes are set in front as in case of most land predators rather than on sides as in case of prey. The field of vision that is so essential for prey animals to look out for hunters comes with widely set eyes. This visual field is compromised in favor of better depth perception and binocular vision in lions that comes with relatively narrowly placed eyes, that aid them in judging distance from prey for pouncing upon it. Tail has a tuft of hair that covers the spine at the tip of tail. Belly skin is loose and shields the internal organs from vicious kicks of hunted ungulates during a kill. Social cats, African Lions are apex and keystone predators. They live and hunt together, increasing the chances of success and survival for themselves and their cubs during harsh seasons. Lionesses do the bulk of hunting by laying a sort of organized trap for the hunted. Each lioness performs a specific role in this form of group hunting. Usually the weak and old are chosen and isolated from the herds. Then one or two lionesses expose themselves by breaking cover and charging at prey. The panicked animals take off and usually end up in jaws of a waiting lioness in their flight. A suffocating hold is placed by biting at the neck of smaller prey or covering the mouth and nose of larger prey. In contrast with previous beliefs, it is now estimated that male lions take part in up to fifty to sixty percent of all hunts, being of particular use in taking down larger prey like buffalo. Other animals taken are of a vast variety depending upon the type and abundance of prey animals in a particular territory. These include eland, gemsbok, hartebeest, impala, kudu, warthog, wildebeest and zebra. At times even giraffes and the young of rhinos, hippos and elephants are killed. Opportunistic predators, lions will hunt and eat anything in times of need including carrion. Some lions in Botswana have been filmed killing elephants after a period of severe drought. Calves were regularly taken and occasionally so were adults under cover of darkness. African Lions are at the top of food chain in African Savannah and do not refrain from wiping out competition if opportunity presents. Conflict with spotted hyenas are common who are often able to intimidate lionesses and cubs owing to their greater numbers, but suffer heavily when they come in contact with males. Adult male lions have been witnessed displaying rather savage behavior towards hyenas on occasions, actively chasing and killing off adult and the young of hyenas. At times lions have been recorded scavenging off hyena kills. Interspecies conflict with other big cats also occurs and African Lions often kill leopards and cheetahs and their young, possibly to ward off competition. 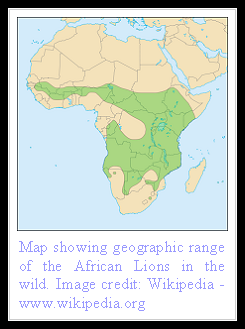 A number of subspecies of lions are recognized, based upon their area of distribution in Africa. Territorial cats, African Lions live in pride areas of up to tens of square miles depending upon the concentration of lions and prey in a particular region. Males regularly patrol the territory, marking it with scent from their paws and urine. At dusk and dawn they roar to establish their presence and warn off intruders. The roar is loudest among cats and can be heard up to a distance of five miles. A pride consists of one to four males and up to a dozen or more of females and young cubs. Females are generally related to each other and usually stay in a pride for the duration of their life whereas young males are kicked off by adults when they are between two to three years old. These young males then pursue a nomadic lifestyle, forming coalitions with other solitary males and hunting and surviving on their own. When they are four to five years old they are capable of taking over a pride of their own. Next they move into the domain of resident males of an established pride and attempt to take over the territory and lionesses. This often results in a bloody and at times fatal battle. If the resident males lose out, they slink away and the nomads are quick to kill any cubs sired by previous males. This brings the females into estrus. The new males also kill or drive away any young males. The take over is often brutal and sometimes takes months. After the lionesses have finally settled down, the new males have only a period of two to three years on average to produce cubs of their own that can successfully reach adulthood and propagate their genetic line before they are ousted as well. Females come into estrus year round and produce a litter of two to three cubs after a pregnancy lasting between three to four months. The young learn hunting by one year and are fully independent by two years of age. Maturity is reached by four years in females and five years in case of males. Lifespan is between twelve to fifteen years in the wild and around twenty five years in captivity. Once numbering in hundreds of thousands, African Lions have dwindled over the past decades to between twenty to thirty thousand animals, owing to reasons not well understood. Conflicts with humans, loss of prey and habitat are supposedly the possible causes. Diseases like Canine Distemper Virus and other outbreaks like stable fly attacks have wiped out hundreds of lions in the past and are a serious threat today, particularly with fragmentation of lion habitats and increasing risk of loss of genetic variability through inbreeding. Though hundreds of African Lions exist in captivity worldwide they are under threat in the wild, with their current classification being Vulnerable. The King of Beasts is the spirit of Africa and the color of Africa and deserves our respect and protection for it to reign as the Monarch of African wilderness for generations to come. I know African Lion is the undisputed king of the plains of Africa.I like them very much.They really look like a king. Lions are one of the most amazing and dangerous animal but the most interesting matter is When I see and lion in the zoo I feel a strong wish to put my hand in it's long hairs and give some comfort. From picture the attitudes of African Lion is the undisputed king of the plains of Africa. The prove that African Lion is the top cat on earth.I like this big cat very much. They are really royal.Thanks for the post. Its not only the large cat..Its also the king of the cats. In the picture the loin is looking like a real king.Thanks for the post. I am a bid fan of this bis cats.I like their Attitured and personality. I am working with the National Geographic Society to make people aware that due to recent events the lions of southern Kenya are in imminent danger of extinction. I thought that readers of your blog would want to know of this potentially tragic happening. NGS is working to protect the current remaining lions, but also to establish programs that will help the population grow and thrive well into the future. The key to protecting the lions is first to remove the economic incentive to kill the lions. These efforts involve creating a sustainable balance between local Maasai communities and lion groups. The situation has unfortunately reached a critical level. Unless something is done immediately, there will be no more lions in this part of Kenya, which would be a tragedy. Please take a moment to visit www.NationalGeographic.com/Bigcats to learn more. There is still hope that we can protect these majestic animals, but we have no time to lose, and it is vital that word be spread among those who love not only lions but the beauty and culture of Kenya. Thanks BTSO1001 for highlighting this very important issue. Maasai lions do need our urgent protection if they are to continue to survive in the wild in the coming years. I'm glad to help National Geographic Society on this conservation issue. I've posted about it on my blog's home page and hope that the readers learn, contribute and spread the message. Interesting site. 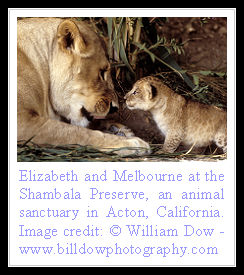 You may like to check a few references for your subspecies classifications for african lion though. Nice blog I have a special fondness for the large cats. Will be back to look around some more soon! Amazing coat. I wish I had somthing like that . Sometimes things really amaze me, that amazes me! lions are the best bg cat EVER!!!!!!!!!!!! True lions are probably the only best surviving big cats in the world with the range and the population of the lion.These are the population numbers of the big cats. It shows how well some big cats are doing,but the lion is flourishing,the other big cats are close to becoming extinct,the lion is only near threatened so is the jaguar,and the leopard is making it well but the lion is the 2nd big cat that is increasing its population number. I need to have this answer asap. Why are the eyes of a lion set on the front of its head rather than on the sides? How does this help the lion survive? At the very 1st, I’d favor to state thanks to you for this enlightening article. Second, I'd prefer to wonder wherever I can learn a lot more info concerning your post. I arrived right here via Bing and can't discover any associated web websites connected to this matter. http://xn--c1aidaj7av7a.com.ua/ How do I sign for your web blog? I had prefer to stick to your updates as they arrive along! I'd a query to interrogate but I forgot what it absolutely was... anyways, thank you very much. Our website is number in HR Assignment Help & HR Homework help. This is preferred destination for various students to get their HRM assignment done. I loved the way you discuss Operations Management Assignment Help the topic great work thanks for the share. Lions are animals we can learn a lot from. They are so independent and able to live in any conditions. I simply love them. You can read more about us here. Hot And Cold Ac focus being creating a well researched and lively content on any topic. These kind of American lions are the best one. I am sure that different cheap essay writing services have worked on them to make some best research to be published in research papers. Ramani Realtors, a normal producer, rent house in Coimbatore promoter and Land creator and one of the fundamental property diagrams in Coimbatore and Chennai markets, have been seen and have won distinctive respects by driving and assumed establishments across finished India. Ramani Realtors don't battle rather essentially build and execute in light of customer's in vogue suppositions with respect to their homes by doing wide research and conceptualizes before setting up course of action of a wind. This present perceptiveness' blended with latest progress in the field impacts us to give comfort living spaces to our customers fascinatingly and in addition to stand isolated and be a frontal projection among others in the field. I want to read your blog. There is a lot of good information on this blog, I loved reading it and I think people will get a lot of support from this blog. Sam, I have written this kind of blog, you will get service & Support from this too. I hope you like my blog, Users will get a lot of information from this blog. I hope you get a lot of Fully support & help from this blog. For other information in the future.